Length of the handle cm. Vorsma knives: quality, reliability, popularity. The knife factory in Vorsma - Russia produces high quality knives of various types of steel for more than 10 years. The birth of the crafts in Vorsma (then the village of Vorsma) related to knife production and metalworking began in the 17th century. The lands around Vorsma were barren and for the local people was very difficult to sustain, but brown iron ore was found and people began to melt it in small blast furnaces to produce steel. The inhabitants of the village of Vorsma started out with the making of knives, scissors, cutlery, various tools and weapons. Since ancient times, locals have been known throughout Russia for their assiduity and tendency to work as blacksmiths - in the 18th century, Vorsma is already the centre of metalworking crafts. The Vorsma factory was launched in May 2005 with a team of 5 people who were engaged in metal forging and knife making by renting separate rooms for this. Today, the factory is a participant in the Russian market and producer of quality tools used with different applications. Over time, gaining experience, they experimentally discover new production methods and improve their work. Gradually, thanks to skills, patience, love of work and great diligence, business goes up and demand for these products is growing. Production capacities have been acquired by 2010, the latest equipment is purchased, and product quality control is tightened, with more than 50 staff at that time. Today, the company occupies a leading position in the steel blades market. And this applies not only to the countries of the former Soviet Union but also beyond its borders. Currently, the range of Vorsma knives is quite wide and new types of quality knives appear every year. During the production period the blades are subjected to heat treatment, grinding and abrasive treatment. Each blade has an optimal thickness of the cutting edge, which is selected depending on the purpose for which it will be used. Hunting knife Barakuda made of BULAT steel and handle from black hornbeam Hunting knife Barr.. Hunting knife Griff of S390 Bohler steel and handle of Karelian birch The new Hunting knife .. Hunting knife Barracuda from x12MF steel and birch wood handle The Barracuda hunting knife c.. Hunting knife Barracuda made of steel x12MF and handle black elm and acrylic Compa.. 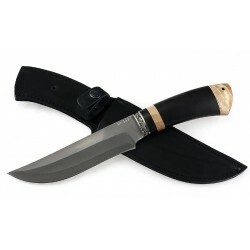 Hunting knife Katran and wenge-black hornbeam handleThe blade of knife Katran is ideal for chopping.. Hunting knife Neptune from steal x12MF and wenge-black hornbean handle Hunting knife made of ste.. Hunting knife GRIF from XB-5 steal handle wenge-carrel birch Hunting knife model "Griff" is a st..